Take in the morning as it may make you feel too energized for sleep. Ensure to nurture your body with extra vitamins, as the starfire gold will begin to help your body build and repair on a cellular level. Please note you may notice a strong effect at first and it may seem that it flattens out but that is not the case. It is normal to only notice the change in your body, after you’ve noticed the effect, the sensation of change may feel “flat” yet it is still doing its job having an accumulative effect. You can also slowly up your dosage after a few weeks by gently increasing or by adding an additional dose later in the day or trying a different variety. Shake liquids well before using. Start conservatively with 4-6 drops or ¼-1/2 tsp in the morning. For powders start small with 1/10 tsp to 1/8 tsp. You can slowly increase the liquid or powder amount until you notice the effect by increasing the dosage or repeating mid-day. Some people take a lot, some people take very little. How much is right for you must be determined by you. You can take your dose in an acidic beverage such as orange juice or other citrus juices, coffee or even “emergen-C”. Why? This helps release the m-state by breaking the magnesium it is contained in. Please note if you find yourself feeling grumpy or too drawn towards isolation with books drawn across your bed you may be experiencing what the ancients referred to as Hermeticism. Consider backing off your dose or stop taking it until you feel normal again. Some signs can be grumpiness, visual distortion or intense and obsessive thinking. Store in an EMF free area, away from TV’s microwaves and computers as well as blenders, motors and electronic stoves. Store in a cool dark place, like a cabinet or metal tin. The Spagyric formula must be refrigerated. All other forms need a dark and quiet place. Consider addition supplements or taking a multi-vitamin minimally to help your body repair as the ORMES often repairs cells. Some people “charge” their ORMES by placing it near crystals or other sacred spaces. Some place it in a pyramid. This is fun and up to you. It is said to “program” your ORMES to keep that “vibe” unless it picks up a “vibe” from elsewhere. The ORMES is feminine in nature so it will receive light and respond. Another way is to imprint sounds via the solfeggio frequencies, these seem to have an astoundingly positive effect, especially in liquid forms. Think of Masaru Emoto. Starfire Gold also known as ORMES - Orbitally Rearranged Monoatomic Elements. 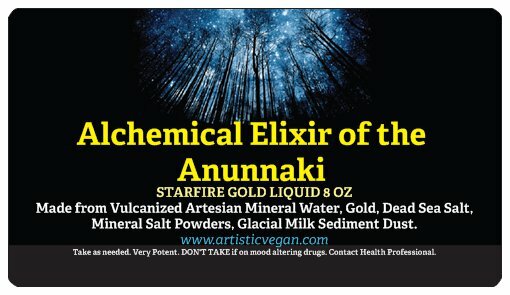 Starfire gold is an alchemical substance that was used by the Anunnaki to prolong their lives by preventing their telomeres from deteriorating, Gerald Clark writes about it in his book The Anunnaki of Nibiru. Starfire gold is known to provide mental clarity, it works as a superconductor of energy lighting up your energy body, aids in raising consciousness, and has been used since ancient times for extending physical longevity. It also lights up your pineal gland producing DMT! “When Moses approached the camp and saw the calf and the dancing, his anger burned and he threw the tablets out of his hands, breaking them to pieces at the foot of the mountain. Now, thanks to Gerald Clark and his research, there was a strong pull for his fans to try it, not just the elite! That’s why now we offer it. Known to be beneficial for spiritual enhancement, clarity, anti-aging and so much more! See the store and click on the individual product for specific information related to that product. WARNING: You should not take this product if you are on prescription mood altering drugs. It can release all the body chemistry the drugs inhibit. We must advise that you consult your Doctor or other licensed health care provider before you ingest this or any other substance as a dietary supplement. This information has not been evaluated or approved by the FDA and is not necessarily based on scientific evidence from any source. These statements have not been evaluated by the Food and Drug Administration (FDA). These products are intended to support general well-being and are not intended to treat, diagnose, mitigate, prevent, or cure any condition or disease.